Early Saturday morning riders were awoken by lightning and heavy rain. Starting at 5 that morning monsoonal rains drenched the bone-dry Park City Point 2 Point racecourse. While the rain and lightning came down, race officials prepared a plan for the day and after a one-hour delay riders were unleashed on the course minus the 11-mile start loop in Round Valley. Once the decision was made, the racing was on, with some of the best ultra-endurance riders in attendance. 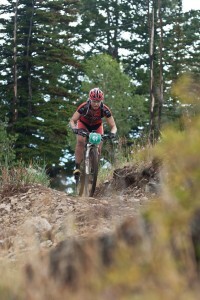 3-time PCP2P champion Alex Grant (Cannondale) was the heavy favorite. Grant was joined by National Ultra Endurance race winners Josh Tostado (Bach Builders) and Drew Edsall (Kenda/Felt), Breck Epic winner Ben Sonntag (Durango Bike Haus), Cary Smith (Team CF), and Yuki Ikeda (Topeak/Ergon). Grant led into the opening singletrack, determined to get out front in the muddy conditions. The German rider, Sonntag, accustomed to training and racing in the mud, joined him while Colorado’s Nick Truitt (Yeti/Pactimo) also joined up before being gapped on the climb to Deer Valley. Once the leaders hit the Steps climb the Cannondale rider started to gap his friend and former teammate Sonntag. Sonntag was not able to match Grant’s pace on the steepest climb of the race. 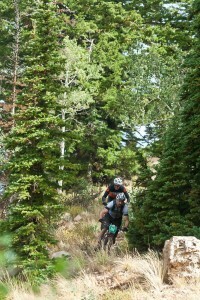 By Park City Mountain Resort, Grant was already a few minutes ahead and approaching his favorite part of the course. Sonntag did his best to stay close but would lose 5 minutes before the finish. Breck 100 winner Josh Tostado ran a strong race, riding in the top-5 all day battling Cary Smith, and Jason Sager (Jamis) for third place. Sager was dispatched after a catastrophic mechanical and Tostado took third by just two minutes over Cary Smith. Nick Truitt had one of the toughest finishes of the day breaking his chain just 3 miles from the finish. The Yeti/Pactimo rider was forced to run and coast his way to the finish, dropping from fourth to fifth before crossing the finishline, broken chain in hand. Amanda Carey won the women's open race. The women’s race featured an equally stacked field of top ultra-endurance talent including defending NUE champion Amanda Carey (Kenda/Felt), mountain bike legend Tammy Jacques-Grewal (Spooky), and Stan’s NoTubes elite rider Jenny Smith. From the start it was Jenny Smith taking the lead, looking comfortable on the wet trails and reveling in the hero dirt singletrack throughout Park City. By the top of Deer Valley she had amassed a lead of several minutes over Jacques-Grewal and last year’s Point 2 Point winner Carey. After the opening miles, conditions on the trails were perfect and riders smiled their way through the tight, technical singletrack that constitutes over 90% of the Park City course. As the riding wore on, Carey slowly began to bring the leaders back. At which point a freak encounter with a belligerent hiker virtually ended Tammy Jacques-Grewal’s race. As she descended John’s Trail, one of the most popular biking trails in Park City, a lone hiker ran up the trail refusing to yield to racers. When the unidentified hiker reached Jacques-Grewal a collision occurred knocking the sub-100 pound rider off her bike and striking her head. Thankfully, other riders chased the hiker off but this marked the end of Tammy’s day. At this point, Carey took over second and was clearly on the move as she closed in on the leader Smith. A brief wrong turn by Smith brought the Kenda/Felt rider even closer. Finally on the Spiro trail, the last big climb of the day, Amanda Carey took over the lead and clearly had plenty left in her tank. By the end, the Kenda/Felt rider would take the win by over 8 minutes. Local Utahn and 4 Life racer KC Holley also paced herself well, keeping her speed high through the last 25 miles of trail and eventually crossing the line with a faster time than Jenny Smith to take second. Holley has entered every edition of the Park City Point 2 Point with Saturday’s second place being her best finish yet. Jenny Smith came home in third. Fourth place went to Australian Katherine O’Shea (Torq Nutrition) while Erin Swenson (3B Yoga) took fifth. While weather played a major factor at the fourth annual PCP2P all riders commented on the outstanding condition of the trails after the race and couldn’t say enough about the incredible riding in Park City. Due to heavy rain and difficult course conditions several riders made a wrong turn that took them off course and immediately back on, cutting out a 2-mile loop of trail. Upon hearing of the course deviation, officials identified the confusing turn and, after fixing it, determined riders who took the cutoff missed 20 minutes of riding. At the finish, riders who missed the turn and eliminated that portion of the course were given a 20-minute time correction. Ben Aufderheide and Chris Holley were the only Open Male finishers affected by the correction.